NOTE: One or two people have indicated that they have had a problem with the compatability of these files with their system. From our experience, this happens with about 2 out of 1000 customers. If you do have a problem, please get in touch wtih us at darkravengames.com and we will be happy to take care of this for you. Bring the your Cthulhu adventures LIFE in your table top games with this track, "The Mystery Unfolds", from our full "Return of the Old Ones" soundsuite by our master of composition, Joshua Cohen! Created as part of an original Kickstarter with 225+ backers! This product, purchased for $0.99 contains one 320kbps MP3 track with an 9+ minute track with background environmental sounds. 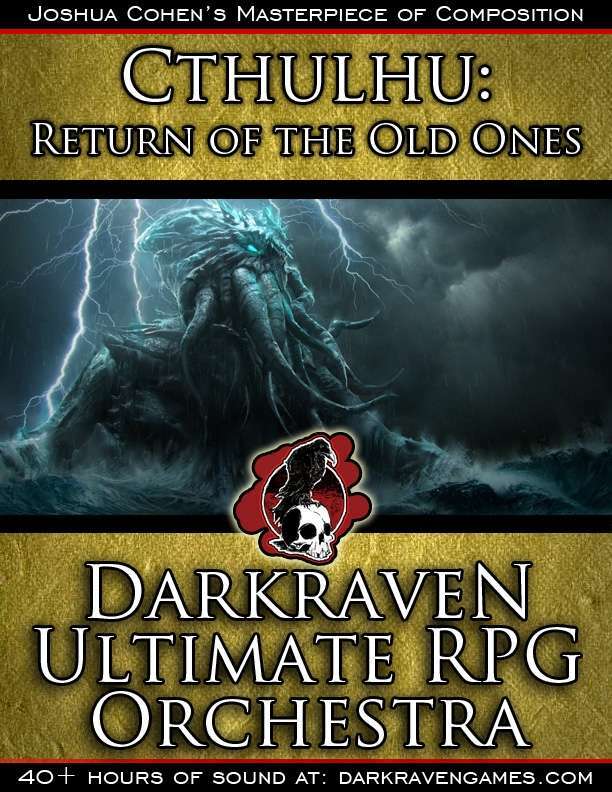 The "Cthulhu: Return of the Old Ones" collector's edition, available only at darkravengames.com for $14 (regularly $19), has 2 bonus compositions which are not available anywhere for purchase individually! This title was added to our catalog on August 01, 2016.